The retailer trounced expectations for the fourth straight quarter this week. Home Depot (NYSE:HD) announced earnings results this week, and for the fourth straight quarter it beat management's -- and Wall Street's -- expectations. Sales and profits spiked higher by 10%, which is an awesome feat for a $90 billion-a-year business. Sales rose by a scorching 8.9% at existing locations, compared to 7.3% in Q3. That makes Home Depot one of the fastest growing national retailers around. The company is also in a class of its own within a home improvement industry that's benefiting from a long-running housing market recovery. Rival Lowe's (NYSE:LOW) improved comps by just 5.5% over the same period. For the full year, Home Depot's comps rose by 5.6%, trouncing the 4.1% forecast that management initially laid out last February -- and even beating the 5.3% growth it logged in fiscal 2014. Home Depot processed 332 million customer visits in Q4 for a 5% traffic boost over the prior-year period. The core retailing categories performed well, but the retailer also succeeded with Black Friday deals, holiday décor, and gift products. Not only did shoppers visit more often, but they filled their carts higher once they were inside the store. Home Depot's average customer transaction spending rose by 3% to $58. Combine the traffic and spending increases, and you get a sales figure that jumped over 8% to $325 per square foot. Expenses grew at a slower pace than sales, which led to a nice jump in profitability. 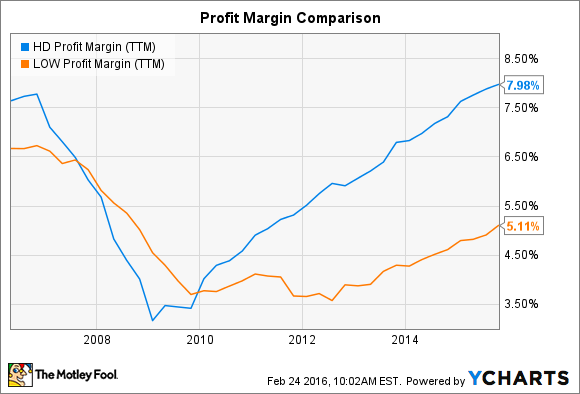 Operating margin ticked up to 12% of sales from 11% last year, and for fiscal 2015 Home Depot's profit margin was a strong 13.3%. The company's record $7 billion of earnings translated into an 8% net income margin -- roughly double Lowe's result. "Our focus on improving the interconnected customer experience, along with solid execution and continued recovery in the U.S. housing market, resulted in record sales and net earnings for 2015," CEO Craig Menear said. 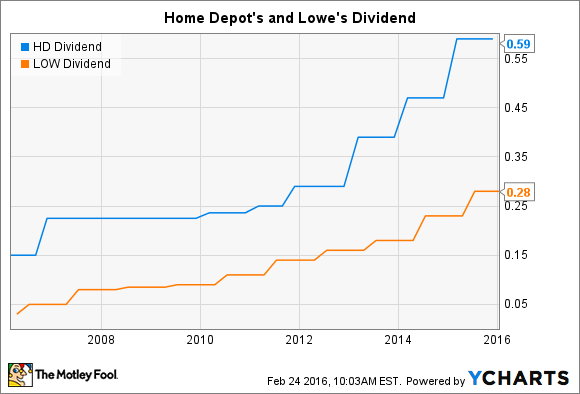 Home Depot generated $9.4 billion of cash in 2015 for a 15% improvement over the prior year. That increase allowed the company to plow money into profitable investments like expanding its e-commerce presence. As a result, digital sales were up 25%, compared to a 13% gain for Wal-Mart.